We went from blustery cold to warm overnight it seems, well except today is rainy and cooler. The rising temps make me happy because this means I can get dirty in the yard again. I love spring because it means everything will wake up from its winter nap and new life will emerge and the yard will need to be mowed and trimmed again. Yes, I love to mow the grass and the smell of fresh cut grass. The photos are from around my yard the past couple years and I cannot wait to see it all green with pops of color again. 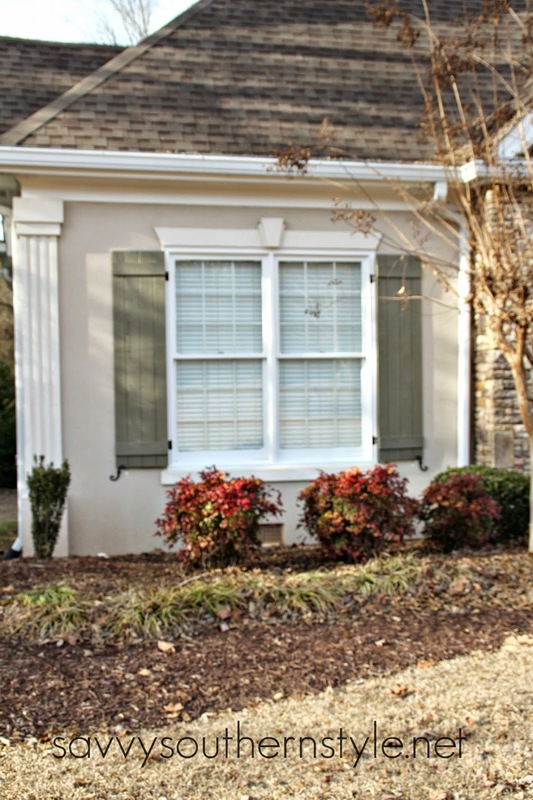 I am looking forward to seeing how my new green gray shutters look with a green yard. My front porch has no color on it right now and has a poor empty pot sitting there waiting to be filled with pretty flowers. I was excited to see the garden department opening up at Home Depot the other day. That tells me it is time to start planting soon. This is the part I don't like. This is back breaking work. My parents always had a very pretty manicured yard that we all worked on together. They were awarded with "yard of the month" many times in our neighborhood. I'm glad I was taught to appreciate a pretty yard and what it takes to have one. Last year I could not find any Kimberly Queen ferns. I hope they have them this year. Last year I ended up filling the pots with other plants. Our yard is a huge mess right now especially out back where broken limbs from the ice storm were dragged waiting to be cut up and removed. I'm looking forward to seeing the dew on the yard in the morning sun. So even though we have a lot of work to do to get the yard in top shape I welcome the challenge with open arms and then I can sit back and enjoy. I know a lot of people say fall is their favorite season, but not me. Glad you stopped to leave a comment, Kamilla. Yep, looking forward to getting dirty outside. definitely spring. I am so anxious for things to start blooming and looking fresh again. we just ordered several pallets of mulch and trying to get that done before things really start growing in the beds and it becomes harder to spread the mulch. We are kindered spirits, I love to get on the mower with my ipod jammin away cutting the grass! We may order it by a truckload this time. They say it's cheaper that way. Rainy and cold today and getting colder then mid 70's the next five days. Crazy weather.I know you look forward to moving in your new place. I wish we could downsize and downsize the yard, too. Spring is probably my favorite season, although I love fall too. Thankfully we did not have many broken limbs, etc. from the ice. One side of my magnolia drooped so low I just knew it would break - but it didn't. I noticed yesterday my tulip tree is full of buds, the bradford pears have buds and my candy tuft is starting to bloom!! I still have pansies in the porch pots and they have rebounded. Can't wait for all the green and the flowers! My husband does the mowing, etc. but I love working with my flowers. I can't wait, too, tina. Going to be in the 70's here the next few days, but cold and rainy today. Oh, I can't wait to to dig in the dirt! You are about a month ahead of us! Your yard and planters already look fabulous, Kim! You must have a bit of a green thumb! Cherry trees are blooming all over the place here, Yvonne and the daffodils are popping up. Spring is definitely in the air here. We lost lots of limbs out of trees, but not much else. One maple out front took a beating, but it looks o.k. since it got trimmed up. I am so looking forward to it as well! It's definitely in the air. I think I love spring and fall equally. I love planting my veggie garden and watching little green shoots come up! I'm so with you! Love to get outdoors and work in the yard. I hope my back can take it this year - or I can get help from the men in the house!! It's usually my thing to work in the yard and garden! That fern is gorgeous - hope you can find one this year!!! Your yard is beautiful, Kim! I am anxious for spring to arrive too! If Home Depot doesn't have them, try your lical grocery store. I had luck there. I checked grocery stores and nurseries last year. They only had Bostons. Maybe this year. I am SO with you, can't wait to get out there!! Now that I have the house decorated for Spring I want to do outside too! I used to LOVE mowing too, now it is done for us but we still can plant our flowers, bushes, pots etc. Can't wait to make the patio pretty again! The mulching I don't look forward too either, it IS back breaking. But it keeps us young, right? Have a great weekend, we are going to get alot of rain, starting tonight:( BOO!!!! Spring is my favorite, too. We are already cleaning up broken branches. Can't wait! I love spring, but have started loving fall too! I am a summer girl with all my flowers but love Spring bring new life into the garden and yard. We are enjoying some above average temps here in Chicago it has been soooo sweet. Have a great week end. I am glad your spring/gardening weather has arrived. I love the photo of the adirondacs reflected in the water. Kim, is Kimberly Queen the fern with ruffled edges? I couldn't find a ruffled fern in south Ga. last spring. I like those because they aren't messy shedders. Beautiful precise edging on your beds I so admire. Beautiful list! I can hardly wait for Spring. I love the smell of freshly cut grass as well! I can't wait to get outside and do some planting too... But, it is just too cold up here in New York! It doesn't feel like cold is ever going to go away from here! Your yard looks so beautiful, I can't wait to see what you do this spring! Spring and Fall are my favorite seasons, though I do love the first snowfall of winter! Your landscaping is beautiful, I can't wait to get started on our yard and tweak it a little bit more this year. Warmer temps always make me want to dig in dirt! Such pretty pictures from last year. I know your yard will look beautiful again this year! It won't be long till we hear lawn mowers humming outside. Today was so wet and cold! Yuck! Your garden is beautiful and I'm sure the flowers will look even prettier this year with your new shutters in the background! I typically love Spring. However, California is in such a DRASTIC drought that it will be a dry, dangerous Spring and Summer for us here. I can't complain, because California is beautiful - but I do worry. You already know mine! So glad it's almost here!! !